This is the first of the Automat series. This one is simply called "Automat." 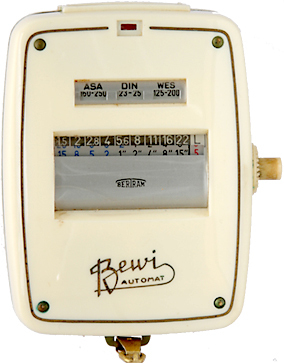 Subsequent models were given letters: the Automat A, the Automat B, Automat C and Automat C2. Automat means automatic, and the idea was that you set the the film speed by turning the knurled ring on the side, then you aim it, press and hold the button for a couple seconds, and when you let go, the ƒ/stop-shutter speed combinations appeared in the window in the center. A pretty easy to use meter—if it works properly. Personally, I find the dials almost impossible to read. The numbers are very small, the little glass magnifiers don't quite do it, and often the numbers simply don't line up right and they're cut off, so you have to jiggle it a bit to see them properly. It's a really interesting idea, but it doesn't quite come off.